When I lived in German Village, I traveled Fourth Street to reach northern destinations. At the intersection of East Main and South Fourth Streets, I’d glance leftward and take stock of what was on display in the windows of the building on the southwest corner. With its giant corner sign and its distinctive selection of merchandise for the home, Block’s Furniture at 153 East Main Street was hard to miss. Today, I walked over to that building to visit the Hawk Galleries, which now makes its nest at that address. The corner sign is still there, but birds of a very different feather have flocked together for the galleries’ current exhibition, Predator and Prey. 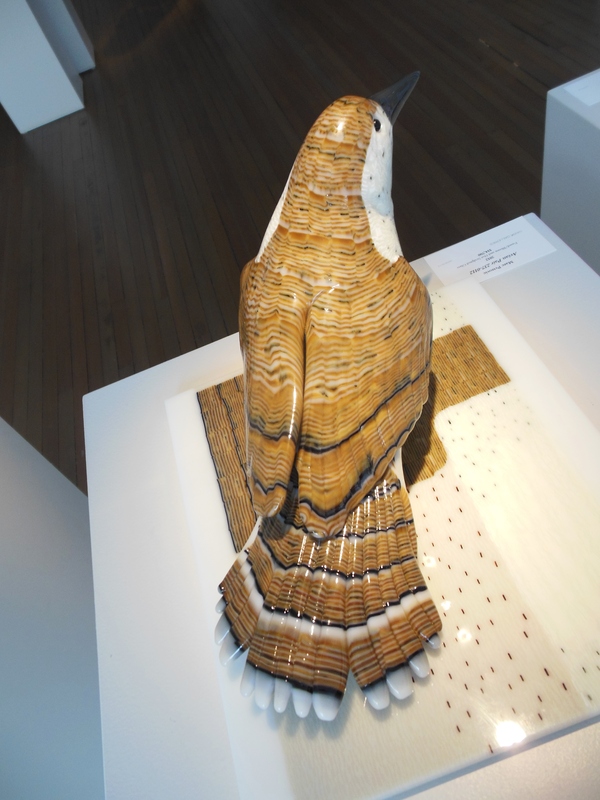 The exhibition features the work not only of 19th-century American painter and naturalist John James Audubon, but also of glass artists Mark Petrovic and Kari Russell-Pool, a Connecticut-based husband and wife who are Cleveland Institute of Art graduates. Most of the Audubon prints on display come from Oppenheimer Edition facsimiles of The New-York Historical Society’s collection of watercolor studies Audubon made preparatory for the publication of the double-elephant folio edition of The Birds of America. 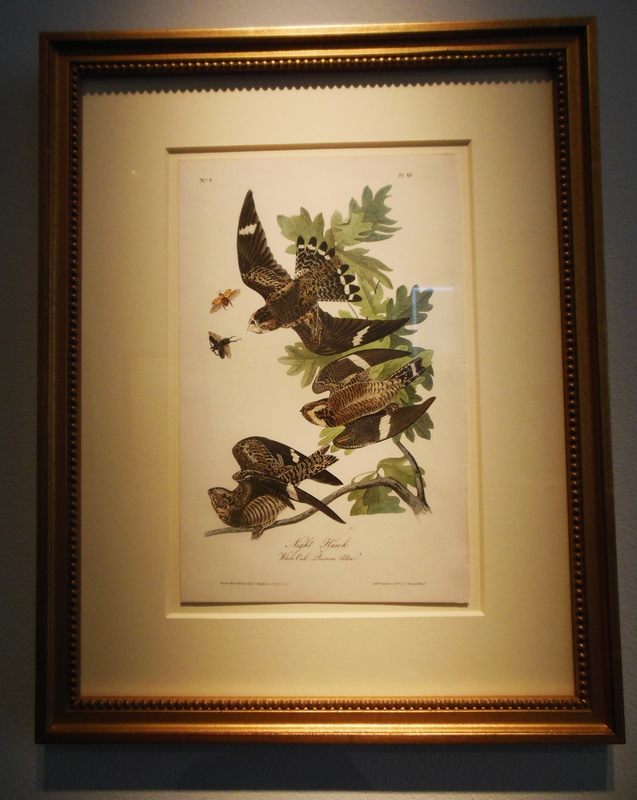 But what your Special Collections librarian really fell for were Rough Legged Falcon and Virginian Partridge, two original Audubon prints that were engraved, colored and printed by Robert Havell in the 1830s. Audubon’s iconic prints are complemented by some spectacular glass creations. 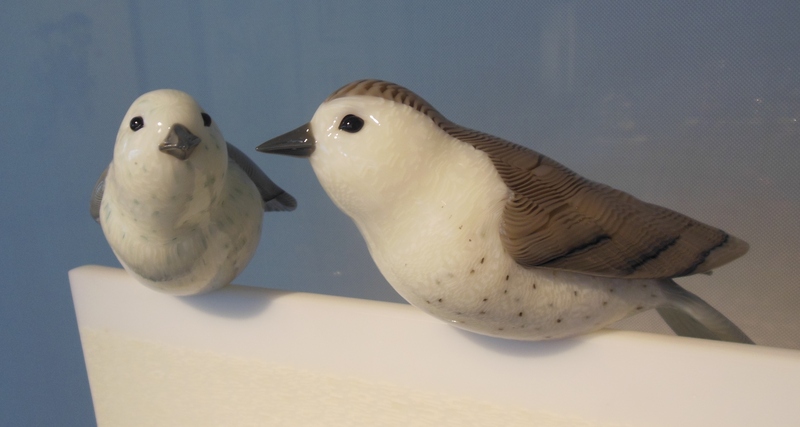 Let’s start with Petrovic’s hot-sculpted and blown Bullseye glass birds. A flock perches on small posts jutting out from a wall. Others rest atop fused glass patterned tablets. Petrovic makes his own murrini, or slices of variously colored glass canes, to create the variegated feather patterns of the birds in his “Avians” series. He sculpts the opalescent glass to form the bird’s anatomy. 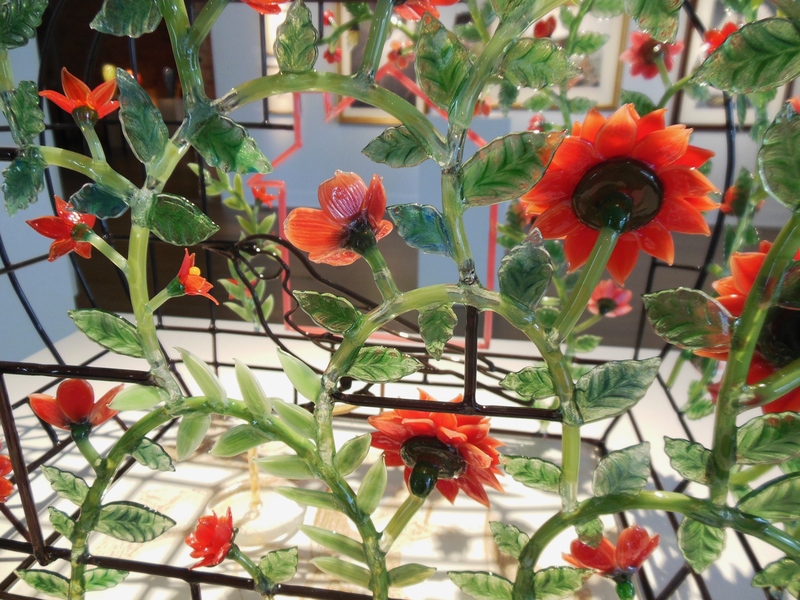 These birds have their perfect mates in Russell-Pool’s exquisite flame worked glass structures. 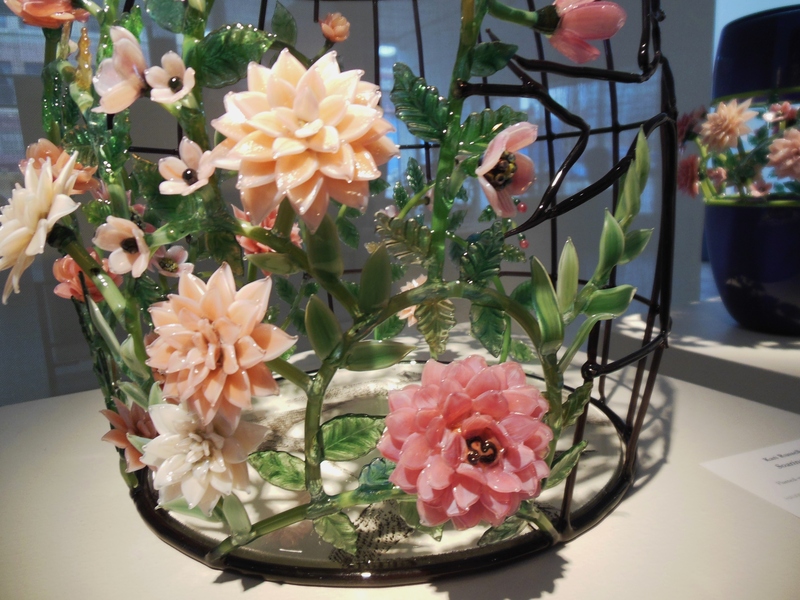 Baskets and “wish bowls” are fashioned out of entwining glass flowers. Birdcages top fused glass bases decorated with images of birds. Aren’t these things breathtaking? Imagine what these artists’ studios are like! Predator and Prey will be on view through July 28. Hawk Galleries is open Tuesday-Friday 10-5:30; Saturday 11-5; and Sunday 1-5. 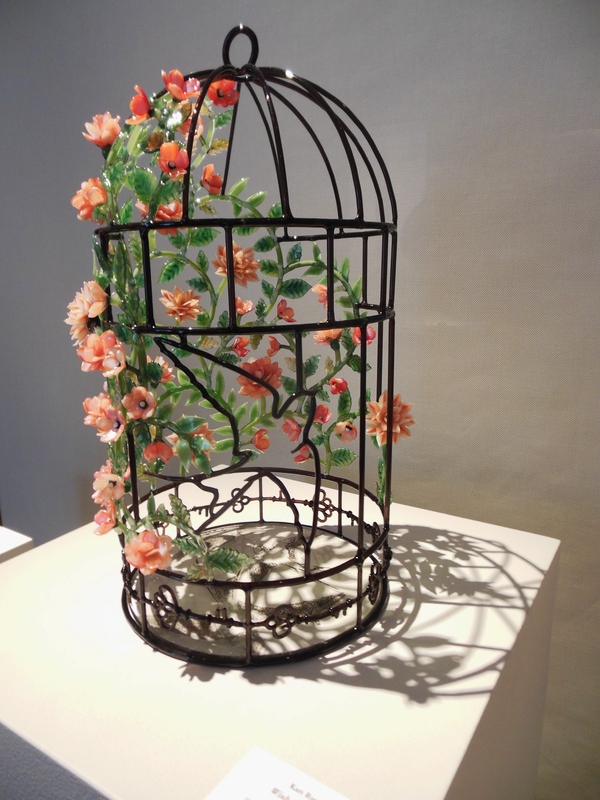 This entry was posted in Art, Birds, Books, Columbus, Flowers, Nature/Outdoors. Bookmark the permalink.